The annual musical moment of truth honors the artists who are infiltrating the music landscape, Macklemore and Ryan Lewis, MGK, Jack White, fun., Avicii, Kendrick Lamar, Skrillex, Best Coast, Grimes, A$AP Rocky, Frank Ocean, and more are vying for chunks of wood this year. Woodie Award voting opens today at Woodies.MTV.com and runs through March 14, 2013 at 4:00 p.m. ET. The “2013 mtvU Woodie Awards” and Festival are returning to Austin, Texas for a full day of musical performances on Thursday, March 14, 2013 during the SXSW Music Festival. 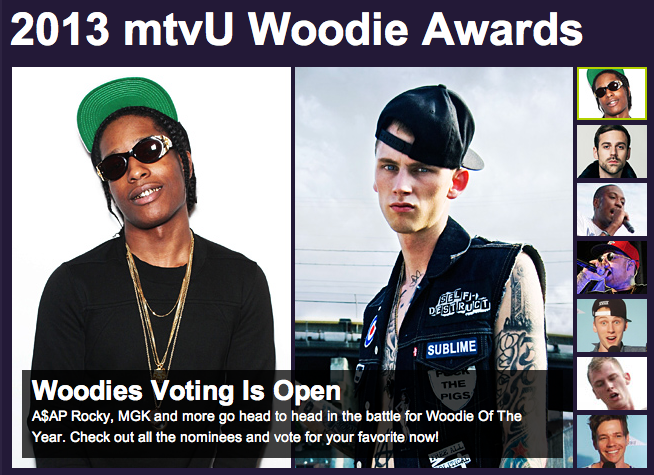 MTV and mtvU will air a half-hour “2013 Woodie Awards” special on Sunday, March 17 at 8:00 p.m. ET/PT. mtvU will announce performers at a later date.